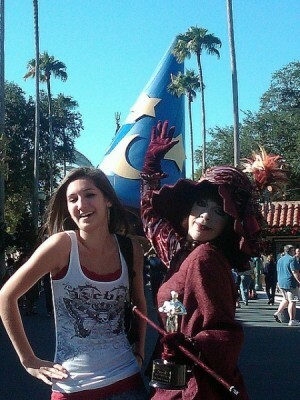 Hooray for Disney's Hollywood Studios!! Hooray for Disney’s Hollywood Studios!! When most people think of Disney’s Hollywood Studios, their thoughts often turn to thrill rides such as Tower of Terror and Rock n’ Roller Coaster or the silly, competitive fun of Toy Story Mania. Disney is overflowing with Streetmosphere not only in human form, but also I would suggest, in structural form too. Just walk through the gates and you are pulled into the ambiance of old Hollywood. The architecture in this area of the park has tones of Art Deco design, tall palm trees line the streets and benches close to the curb entice visitors to wait for a bus or taxi that will never come. The Streetmosphere is so rich you can hear the woozy, smoky music buzzing about even before you get to the Tower of Terror lobby. The Citizens of Hollywood Studios, are representative of the 1930’s and 40’s. One year, my daughter and I were greeted by “Dorma Nesmond”. She approached us with a roaring welcome of “Dahling, where have you been?” To say she was slightly dramatic would be an understatement, but she was awesome fun to chat with. What impressed me most what that she knew all about the Borscht Belt, which happens to be the area we are from in the Catskills. She chatted with us for quite a while and it was a terrific welcome to the park. Another time, we were sitting on a bus bench on Sunset Boulevard when all of a sudden “Carlotta Diamond “ came up to my daughter and asked to see her jewels. When my then 10 year old daughter pointed to her earrings, “Carlotta Diamond “reeled back and told her “My dear, you most certainly need a ring to go with those beautiful earrings” and she proceeded to open her purse and present my daughter with a lovely ring to compliment her ensemble. 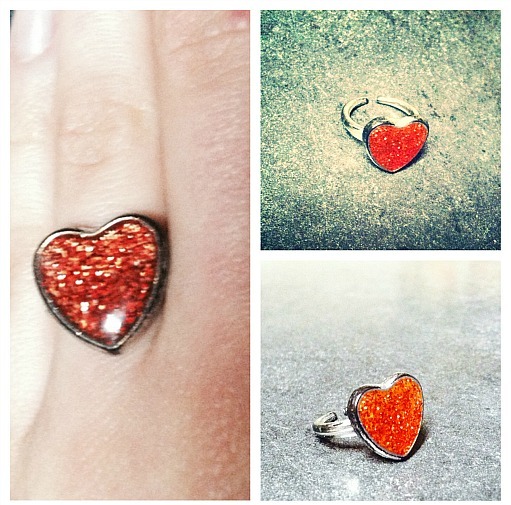 My daughter still has the ring in her jewelry box more than 10 years later. Other popular citizens in Hollywood Studios are director ”Vladimir Phooey“and his budding starlet. She is slightly naïve and he is slightly demanding and together these two are hysterical. Visitors are often asked to participate in the skit they put together and the shenanigans that result are good old fashioned humor in the vein of Lucille Ball. 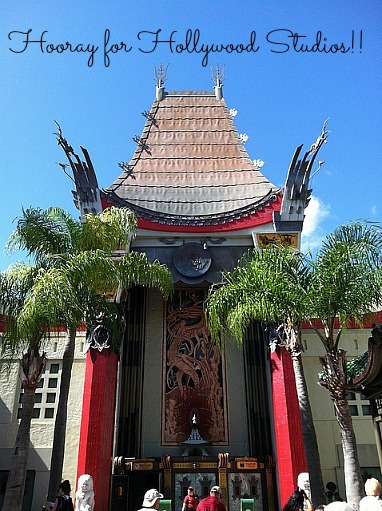 After you’ve had your fill of laughs, you can stroll down Hollywood Boulevard to the Great Movie Ride. Outside the ride are the cement footprints of some of your favorite actors. Burt Reynolds, Roger Rabbit, Tom Hanks, Bob Hosking and Daryl Hannah to name a few. It’s always fun to see who has bigger feet, you or Tom Hanks and who can resist sizing up hand prints. It’s also a good place to introduce your children to some stars of yester-year. Make sure you check out Wendy’s article from yesterday to find out more about these great artifacts! Once you have left Hollywood Boulevard, stroll down towards Pixar Place. Not only are you destined to run into Buzz and Woody, but if you time it right you may come across the Green Army Men from Andy’s toy box. I love these guys! They don’t speak, but they say volumes as they interact with the crowd and each other through body language. What I really like about the Army Men is that they have little platforms on their feet. 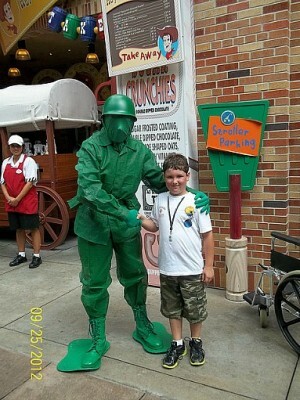 Remember the Army men you or your siblings might have had growing up? When you see them standing at attention, take notice of what they are standing on. There is such attention to detail at Disney and this is just another example. Of course, what would a Hollywood Studio be without some backdrops and those can be found on the Streets of America. Can’t get to San Francisco to film a movie scene, have San Francisco come to you. The area is a good representation of the faux city streets that movies and television shows were filmed on in the past. The Streets of America is a terrific area to relax and catch a breath. Visitors can enjoy live music by Mulch, Sweat and Shears while meandering past the neighborhood grocer, a Brooklyn Brownstone or the hills of San Francisco. If you’re looking to surprise your fellow travelers with some Hollywood Studios magic. Look for the “Singing in the Rain” umbrella on the light pole in this section. Take a few pictures reflective of Gene Kelly’s iconic moment (after you explain to your children who Gene Kelly is). Be careful not to get wet. One of the biggest draws to Hollywood Studios in the fall are The Osbourne Family Spectacle of Dancing Lights. This isn’t your typical neighborhood light show. Imagine standing on the “city” streets and watching over 5 million lights blinking and twinkling in the balmy evening air. This event is so popular that at any given evening between November and January the area could be as crowded as Times Square. The story behind how the lights came to be is almost as amazing as the actual event its self. Read the back story for yourself and then you will have even more reason to appreciate this spectacle. Next time you visit Hollywood Studios, take some time to catch your breath and not only enjoy the rides, but to take in all the Streetmosphere, both in the forms of characters, as well as visually that the park has to offer. So, go powder your nose, cue the music, lights, cameras, action….it’s time for your close-up. What are your favorite smaller details about Disney’s Hollywood Studios? 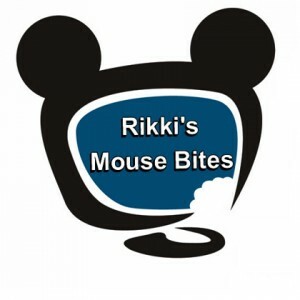 5 Cast Members You Should Talk To On Your Walt Disney World Vacation!